20120308 - Up worked at desk all day. Had a nice dinner with the fam. 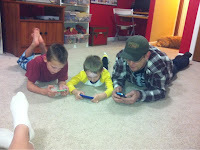 Then up to the playroom for some wrestling, and iDevice night. All boys to bed, I was up late working so I wouldn't have to work Friday.